Localised hypoplasia or aplasia of the great saphenous vein (GSV) is not uncommon, with reports primarily describing limited area of hypoplasia/aplasia around the knee. Long segment of hypoplasia/aplasia extending along the thigh and distally to lower calf is rare. 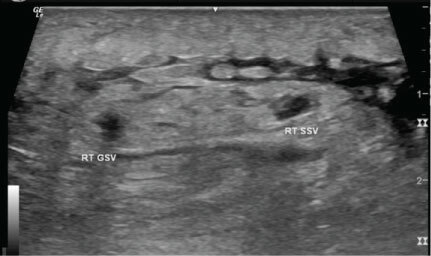 We report a case of an 81-year-old lady with long segment of the GSV aplasia depicted 3 cm distal to sapheno-femoral junction (SFJ), down to 5 cm above the right ankle with direct communication with the short saphenous vein (SSV). An 81-year-old female presented to our clinic for an ultrasound evaluation of the right lower extremity venous system. She reported a long history of dull aching pain, cramping and swelling of her right leg as well as right ankle discoloration. She had no medical or family history of varicose veins. Upon physical examination, hyperpigmentation was observed, along with edema overlying the right ankle. Ultrasound study with duplex was performed on symptomatic lower limb from proximal to distal starting at the right SFJ. Three cm distal to the right SFJ, the right GSV calibre became aplastic, and continued to be so along the thigh and leg. Five cm above the ankle, the right GSV calibre reinstituted, where the vein was seen connecting to the right SSV (Figure 1). No reflux was observed in the right GSV, neither at right SFJ nor at the right ankle. On the other hand, moderate venous reflux of the right SSV (591mS) was observed in the saphenous compartment reflux, through the vein whole course. 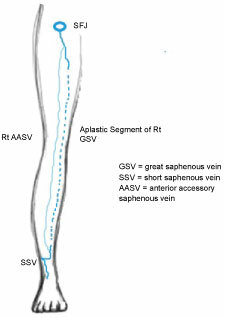 Right anterior accessory saphenous vein (AASV) was seen branching from the right GSV, that was traced distally down to 4 cm below knee (Figure 2 and Figure 3). Furthermore, right posterior accessory saphenous vein (PASV) was seen branching from the right GSV, that was traced distally down to 7 above knees. Following patient's informed consent and under local anaesthesia with tumescent solution, radiofrequency ablation of the right SSV was performed. Additionally, sclerotherapy was performed for the dilated tributary veins at the medial and posterior calf of the right lower limb. No intra or post procedural complications were reported and our patient tolerated the procedure well. She was ambulant minutes afterwards. She had 1 and 3 months follow up following the procedure. Subjectively, our patient reported that her previously described symptoms continued to settle over time. Originating at the medial malleolus, the GSV forms the longest vein in the human body and main superficial venous drainage of the lower limb [1,2]. It runs proximally along the medial aspect of the leg and thigh, in the saphenous compartment and ends by draining into the SFJ. Hypoplasia/aplasia of the venous system is a common variant, with venous system of the lower limbs being the most common site . Hypoplasia/aplasia of the great saphenous vein (GSV) is fairly common, with an incidence reported to be 10-30% in the general population, majority of which is unilateral [1,3]. Along its course, the calibre of the GSV normally enlarges from distal to proximal. If, however, the diameter is seen to decrease or is not depicted any longer, this is known as hypoplasia or aplasia of the GSV, respectively . Most of the cases reported describe a localised segment of the GSV hypoplasia or aplasia, limited to the area around the knee [1,3]. 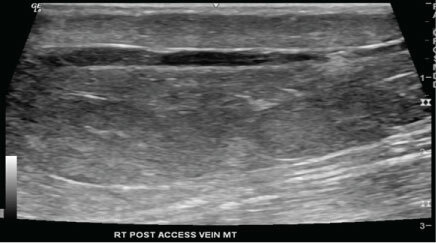 The purpose of this case report is to describe the unusual occurrence of a long segment of GSV aplasia extending from the upper thigh, 3 cm distal to the sapheno-femoral junction (SFJ) and ending few cm short of the ankle by communicating with the short saphenous Vein (SSV). Reported cases were more observed in individuals with varicose veins than not. Perhaps this is attributed to the fact that Accessory Saphenous Vein- which acts as a connecting vein in cases of hypoplasia/aplasia- is not adapted to vasodilatation and high venous pressures as the GSV is. Compared to the GSV, the accessory saphenous vein is rather thin walled with poor supporting structure surrounding [3,4]. 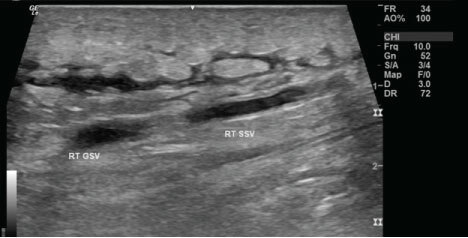 To diagnose segmental aplasia of the GSV, it must be shown that the GSV left the saphenous compartment and that there is no other vein in it. In our case, the saphenous compartment was empty between 5 cm proximal to the medial malleolus up to 3 cm distal to SFJ along with connection to right SSV, the latter displayed significant reflux . Reports of hypoplastic/aplastic portions of the GSV describe short segments limited around the knee. It is rare, however, to have a long segment of hypoplasia/aplasia of the GSV extending from the inguinal region all the way to ankle . In our case, a long segment of aplasia of the GSV was observed from the inguinal region to mid-calf with connection to the SSV (Figure 4). Several variations in the anatomy of the GSV exist. Therefore, preoperative ultrasound examination is essential to identify the anatomy of the GSV and its tributaries . In this report, authors report a rare case of long segment aplasia of the GSV with SSV connection. Long segment of aplasia involving the course of the GSV in the thigh and leg is rare. Sound knowledge of normal variations of the venous map is prudent for adequate preoperative planning. Dr. Mohammed Alagha: Performed the physical exam, ultrasound examination, gathered scientific material, perform the sclerotherpy procedure, follow up with the patient, wrote down the manuscript and followed up the patient. Dr. Mariam Mattar: Reviewed the manuscript and scientific data. Authors do not have any disclosures. Did the author obtain written informed consent from the patient for submission of this manuscript for publication? Yes. Ethical standards followed the responsible committee on human experimentation (institutional and national) and with the Helsinki Declaration of 1975, as revised in 2000 (5). 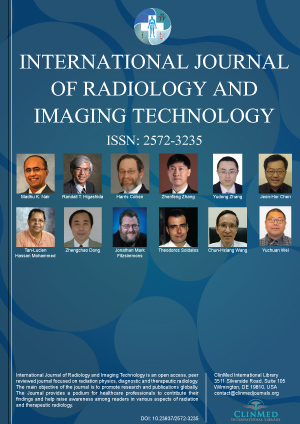 Choi BS, Byun GY, Hwang SB, Koo BH, Lee SR (2017) Long-segment hypoplasia of great saphenous vein with posterior accessory saphenous vein as a connecting vein: a case report. J Surg Case Rep 2017: rjx058. Oguzkurt L (2012) Ultrasonographic anatomy of the lower extremity superficial veins. Diagn Interv Radiol 18: 423-430. Caggiati A, Mendoza E (2004) Segmental hypoplasia of the great saphenous vein and varicose disease. Eur J Vasc Endovasc Surg 28: 257-261. Caggiati A, Ricci S (2000) The caliber of the human long saphenous vein and its congenital variations. Ann Anat 182: 195-201. Oner E, Kurtul Yildiz H, Erok B (2016) Large Saphenous Vein Aplasia. JAREM 6: 62-64. Ekin E, Kurtul Yildiz H (2017) The importance of great saphenous vein types and segmental aplasia in venous reflux. J Clin Ultrasound 45: 332-336. Mohammed Alagha, MD, RDMS, RVT, Department of Radiology, Al-Shifa Hospital, Gaza, Palestine. © 2018 Alagha M, et al. This is an open-access article distributed under the terms of the Creative Commons Attribution License, which permits unrestricted use, distribution, and reproduction in any medium, provided the original author and source are credited.